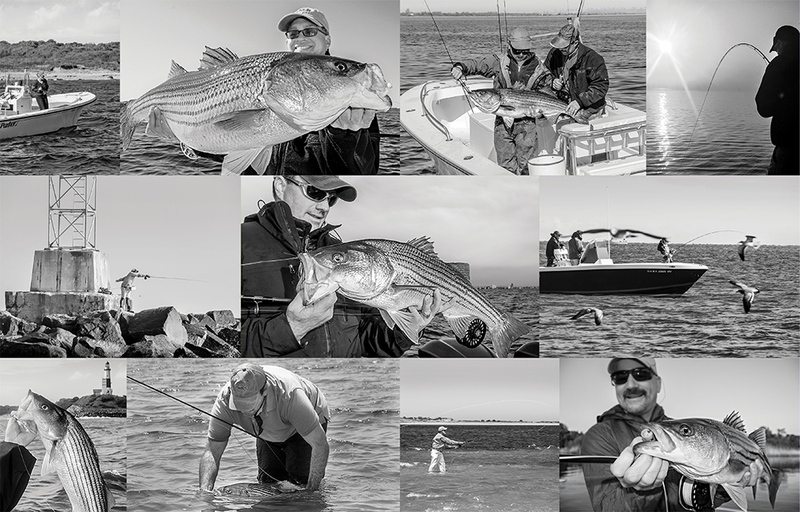 There are anglers who exclusively fly-fish for stripers. I’m not one of them. I love to fish plugs, even bait. But there’s something awesome about targeting striped bass on fly gear. Or perhaps it’s the excitement from moments like when you unfurl a perfect loop to land your fly in the path of a cruising fish and witness the striper’s predatory instincts take over, and suddenly it pounces. Or the times you lay your fly right on top of a boil, begin stripping and, a split second later, the line is nearly yanked from your hands by the jolt of a brawny bass claiming possession of your streamer. Although dealing with wind and a rocking and rolling boat — while remaining steady in the midst of the adrenaline rush that inevitably comes when the target is in your sights — are all part of a fly-rodders learning curve, “Once you get a taste of success, it’s hard to stop,” notes Montauk striper guide Capt. Paul Dixon. So, to everyone willing to undertake the pursuit of stripers with the fly rod, I offer the basics to quickly attain the payoff that rewards our efforts and fuels our resolve to excel at this worthwhile endeavor. Fly rods come in designated weights, enabling you to easily match them with the right lines and reels. Six- and 7-weight are fine for schoolies but lack the power to cast a heavy or bulky fly in windy conditions. Heavier, stiffer (faster action) rods are better suited for punching many popular striper fly patterns into a stiff breeze. A 10-weight is great for windy days, but the heft of such an outfit can be exhausting. A 9-weight is, in my opinion, the best all-around choice. It’s neither too heavy nor too stiff, plus it packs the power to fling a sizable fly in a range of situations and beat fish exceeding 20 pounds into submission. Smaller stripers, unlike false albacore of similar size, won’t run far and take you into the backing. You can generally bring them in by stripping the fly line. But once striped bass reach the 30-inch mark, that’s no longer the case. You better have a reel with a good drag and at least 250 yards of backing. You may not need it all, but when a big fish gets into a strong current, you could be in for quite a ride. Selecting the proper fly line weight is as easy as matching the fly rod specs, but you still need to pick the proper sink rate and taper configuration. The chosen sink rate — floating, intermediate (slowest sinking) or sinking — depends on the application. As for the taper, a weight forward remains the fundamental choice for saltwater. Ranging from the versatile salt water taper to specialty lines, this taper enables the quick, long casts demanded by the majority of striped bass fishing. For topwater action — using poppers and gurglers — and for sight-fishing on sandy shallows and flats, you’ll need a floating line. A floater keeps topwater flies on the surface, and lets you pick up line quickly and cast again if a fish changes direction. 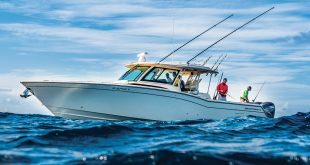 Of course, some situations call for dredging with sinking lines: setting the boat over sounder marks, lobbing the fly line out, and letting it sink as the boat drifts away before you strip the fly back. Sinking lines come in varying weights. The heavier the line in grains, the faster the line sinks. A 350-grain is plenty, but some anglers use 450- to 750-grain lines to get down fast to fish holding deep. If you’re looking for an all-around line, go with an intermediate. It’s perfect for busting fish and blind-casting from the beach, and works well in rip lines too. A 7- to 9-foot, 20-pound fluorocarbon leader rounds out the rig. Tapered leaders help turn the fly over, but straight 20-pound fluoro gets the job done. If the fish are skittish, step down to 15- or 12-pound. However, it’s a trade-off that, while producing more strikes, results in more break-offs. There are many flies that “match the hatch,” in other words, mimic the prevalent forage, but you won’t go wrong with a Clouser Minnow or Lefty’s Deceiver in chartreuse-and-white. Carry some in 1½-, 3- and 5-inch versions, and simply use the size that most resembles the baitfish stripers are feeding on. Surely you’ll diversify as you evolve as a fly-fisher, but you’ll do fine sticking to these basic patterns at first. As any fly devotee will tell you, it takes some practice to get your casting down, and mastering the double-haul — a yank on the fly line on its way forward and another yank on its way back — is imperative to generate the line speed and distance to fish efficiently. Once you can get your fly out there, practice casting with the wind in your face and coming from both sides. Stripers are anything but consistent, so working the fly in a way that entices them to eat it takes a little experience. Sometimes they want it slow, sometimes fast. Baitfish tend to dart around, so make that fly move. That doesn’t necessarily mean stripping it fast, but rather hard and deliberately. 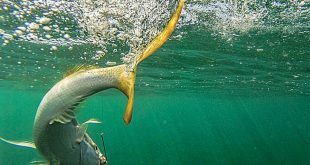 When you get a bite, set the hook with a strip strike: Instead of jerking the rod tip up to set like you would with spinning gear, pull the rod toward your body with one hand while stripping the line hard with the other. Once tight, concentrate on staying tight. 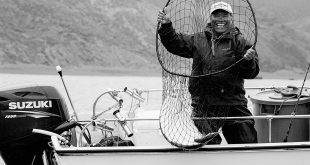 Don’t immediately try to get loose fly line back on the reel; that usually creates slack, providing opportunity for the fish to spit the hook. 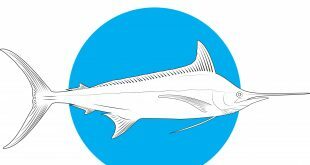 Most stripers can be stripped in without using the reel. If you hook into a large fish that requires the drag to tire, just let any excess line slip through your fingers, keeping pressure on to stay tight until you can fight off the reel. Time on the water pays off. Walk the beach or take the boat out and look for fishy water as often as possible. Of course, birds diving and surface-busting fish are no-brainers. Rip lines usually hold stripers too. Abrupt depth changes push bait up and over the shallow spots where stripers know to wait in ambush. Stripers generally gravitate to any sort of structure. They don’t call ’em rockfish for nothing. Estuarine mud flats, some of the most biodiverse environments on Earth, are loaded with all sorts of baitfish and crustaceans, and are perfect places to throw topwater flies tight against a sod bank. Sand flats are always worth a look too. Just locate areas with moving water and good clarity, and you’re bound to find cruising fish. Land a fly gently in the path of one, and it’s game on. Fly-fishing for stripers takes some work, but searching for fish and stalking the targets only build up the excitement, making every hookup and every battle much more rewarding. These two patterns have produced countless striper catches over the years. From the basics to the specialized, fly line options abound. But it’s smart to carry a floating, intermediate and sinking line to take advantage of all opportunities.